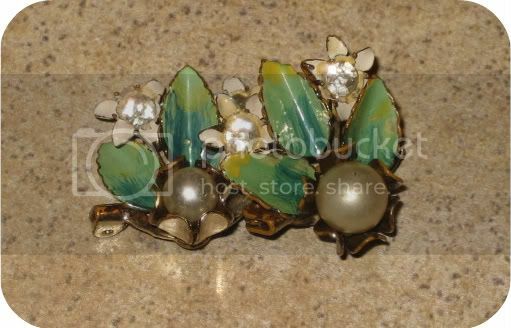 Last week I attended an estate sale what was FULL of vintage costume jewelry. The entire front room of the sale was jam packed with boxes and tables of rhinestones and anything that sparkles. I picked up a lot of great pieces, including a pair of yellow bakelite carved hoop earrings for $3. My favorite find would have to be these scatter pins which are an exact match to these earrings from my grandma. I also found a pair of costume earrings that were twins of a pair I bought from Lana Turner's daughter. I left those for someone else to find and treasure, but it was so cool to discover so many vintage twins at this sale. I have occasionally come across the same dress, but that is VERY few and far between. Have you ever found a vintage twin out there to something you already own? Ooh they're lovely, I wish we had estate sales over here!